The Object Builder is a complete tool set for designing and developing complex applications. What if you had a tool that allowed you to develop new, complex applications quickly? What if that same tool came with a complete architecture and a host of support functionality that made creating a secure, robust web-application or even integrating with existing applications a manageable, predictable and low-risk undertaking? What if that tool came with a complete web UI framework and controls where the web pages could be generated from a simple description by non-programmers? What it included a complete documentation system so that you could also document your applications using the same descriptions. What if you had the Object Builder from ObjetX. The ObjetX Object Builder and couple with Application Platform makes building software, even complex applications, a straightforward process. By providing a unique, simple and powerful way of describing all of the pieces that make up an application, the task of creating the application from the description is highly automated and highly predictable. The ability to predict delivery of product accurately and effectively is what determines the difference between success and failure. What businesses really need is a vertically targeted, out-of-the-box enterprise level Application Builder, Application Framework and Integration tool along with a comprehensive support systems designed to address rapid development and deployment of high function applications. We can provide templates of application descriptions for different industries and business models. Our toolset provides features such as highly automated front-end generation, database generation and management, report and documentation creation, predefined data and process models, standard data-exchange formats specific to the industry and a flexible and comprehensive role-based security model. The Object Builder makes development faster and offloads much of the effort required to build such models from scratch. This software, easy to learn with an architecture designed to support complex, high transaction business software, systems integration and industry standards, will streamline the process of producing a professional User Interface, provide a highly secure and efficient business application layer and ease the task of tying together disparate back-end systems through web services and highly efficient grid based computing to provide rapid access to company data and systems. The technology and application challenges many businesses face in a quickly changing environment can be demanding and are fraught with risk. The good news is that we have the know-how, the technology and the product to help them keep up with those changes and to mange the risk. Companies short on time can implement new software and integrate quickly, effectively and with assurance that they can continue to meet future needs. They can undertake projects with an assurance that they will meet requirements in a manageable and predictable fashion. The Object Builder is designed as framework for associated design, development, test and management tools. Adding a new tool into the Object Builder framework is exceptionally easy - and it is easy to take advantage of the object model in the Object Builder to build your own generative tools. There are a wide array of tools already available in the Object Builder, and many more on the way. What we have below is a classic Object Builder interface showing a number of tools in action. 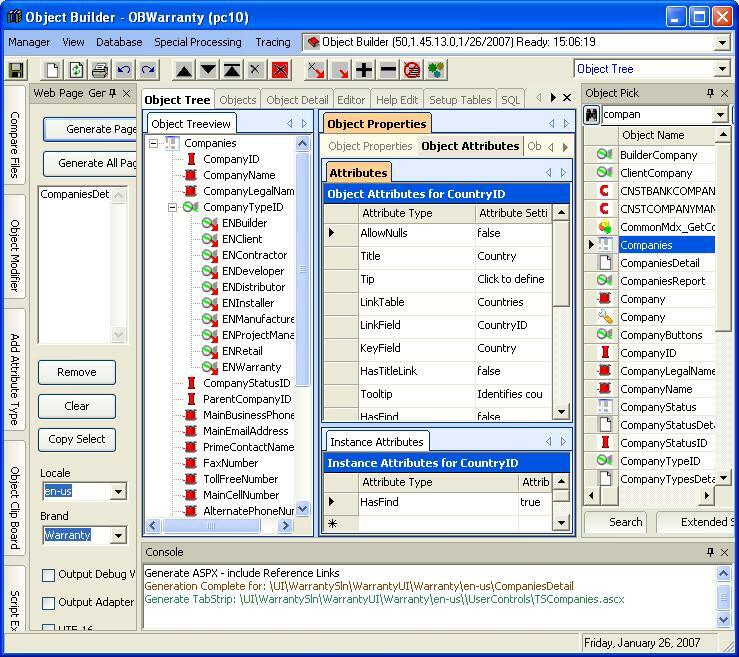 In this case, the tools shown are the Object Tree, Object Properties, Object Picker and Web Page Generation. In the Object Tree we can see the Companies object displayed which represents the Companies table in the SQL Database. Each column in the table is represented as a separate object with it's own set of properties and attributes. The object currently displayed in the Attributes list is the CountryID object which has both base attributes and one instance attribute that applies to the instance of the CountryID object found in the Companies table. We can also see that a CompaniesDetail object has been dragged into the Web Page Generation tool and the web page was generated using the tool. Object-oriented programming (OOP) is a programming paradigm that uses objects to design and build applications, to represent data and to manage different facilities within a compouter based system. An Object-oriented program may be seen as a collection of cooperating objects, as opposed to a traditional view in which a program may be seen as a collection of functions and data. In OOP, each object is capable of interacting with other objects and processing data. Each object can be viewed as an independent little machine with a distinct role or responsibility and a unique relationship with other objects associated with it. Object-oriented programming is intended to promote greater flexibility and maintainability in programming, and is widely popular in large-scale software engineering. By virtue of its strong emphasis on modularity, object oriented code is intended to be simpler to develop and easier to understand later on, lending itself to more direct analysis, coding, and understanding of complex situations and procedures than less modular programming methods.